Although my first "Timeslip Tuesday" post was in June of 2008, and my review of Any Which Wall was written in May of 2009, for some reason it didn't occur to me to consider the book as a time travel story. I think I was too caught up in my pleasure at reading a homage to one of my favorite authors (Edward Eager) to think clearly (although it's possibly I just wasn't thinking clearly in general, which happens). But at any event, having realized (thanks to this post that Laurel wrote at her own blog about her current time travel work in progress) that Any Which Wall was, in fact, a time travel story, I'm revisiting and revising my origional post for this week's Tuesday slot, and putting it neatly on my Time Travel list. Fans of Edward Eager who might be reading this, run, don't walk, to get your hands on this book when it comes out on May 26, 2009, in both the US and the UK! Eager might have written his last book (Seven Day Magic) back in 1962, but Any Which Wall, by Laurel Snyder (Random House, 2009, 242pp, middle grade), continues Eager's tradition in really delightful way. Since Eager, and before Snyder, there were hardly any books written about common, ordinary magic--books with normal, everyday children stumbling across magic in the everyday world, and gradually learning its rules, and taming it, and bending it to their wills...Laurel Snyder set out to pay homage to Eager by writing just such a book, and succeeds brilliantly. Henry and his little sister Emma, Henry's best friend Roy and his big sister Susan (who has to "look after" the others) are not particularly looking forward to a long, hot, Iowa summer. Then they find the Wall, a wall in the middle of a cornfield, a wall that isn't walling anything...a wall that is magic, and will take them to any other wall that ever might have been. It is a splendiferously fun journey through time and space in the best Edward Eager tradition of great characterization, brisk writing, and snappy dialogue among the children. Three of the journeys involve time travel--to fifth century Britain, where the children visit with Merlin and find themselves in a bit of hot water, to early 18-century America, where they meet the "worst" pirate of all, and finally, they take a trip to the 19th century prairie, where young Emma faces down a fearsome outlaw to save a poor dog from his cruelty. 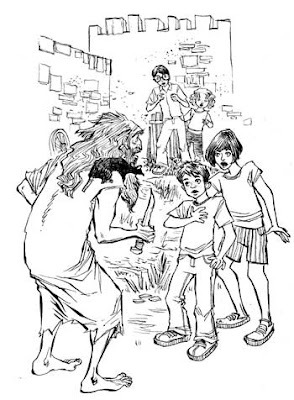 The magic of the wall does not extend to outfitting the children in appropriate clothing; there's no chance for the children to pass themselves off as locals, and nor does the reader expect them to. This, I think, is just as it should be in this sort of adventure--it is not immersive time travel, with the characters stuck in the past for an extended period, but more the exciting tourist sort, where the past, for all its dangers, is treated in a somewhat tongue-in-cheek style. But there is more to this book than the fun of the magical adventure, and I'm not quite sure what kids will make of this other aspect. It is, for all intents and purposes, a moral. An audience of folks in their forties (or so), with families and jobs who nonetheless love children's books, will cheer for Susan and think fondly of their own unicorn (or zombie?) collections. I dunno what a kid, unencumbered by any grownup-ness, would make of this. Will it knock them out of the story? Will they be oblivious? Will they say, Yes! Let me have fun, and believe, and enjoy life....I myself still had my unicorn collection until I was 15, so maybe I would have found this part of the book validating. I don't think, though, that I would have appreciated Snyder's somewhat intrusive authorial aside (several pages in italics) toward the end of the book, in which she extols the importance of plain old fun (even though I agree with what she says). But that being said, it is so awfully nice to have books like this one, that are themselves good, plain fun (and smart and funny). And I hope it sells really really well so that the vague promise of more to come at the end (in the best tradition of this sort of book) becomes reality. Any middle grade kid, boy or girl, with a sense of humor and a sense of adventure should enjoy this lots. Did adore this one and the illustrations. I am looking forward to Snyder's new book now! Does Time at the Top qualify? I love that Susan is ordinary. I am a big fan of Scott Corbett's Trick books. The magic is in the chemistry set but the characters could be our neighbors down the street. Also like the heroine (Elizabeth, I think) of Helen Clare's Dolls in a House series. She carries on calmly when her dolls start coming to life, enjoying it but nearly always the master of the situation. Thanks for the recommendations, CLM--I've read the first, but not the others! Time at the Top doesn't quite count in my mind--too much of the book taks place outside our own ordinary world. But I do like it lots! Helen Clare is also Pauline Clarke. Are you a fan of The Return of the Twelves? Oh, yes--I do like that one! Thanks.